Interested in Jupiter Island? Contact us online, call 561-491-2381 or Email - Team@SimmondsTeam.com to learn more about available listings or book a private showing. Contact us to learn more about selling your home with the Simmonds Realty Team. Completely renovated and rebuilt home in 2017. This Oceanfront home is on 1.82 acres with 200 feet of ocean frontage. Amazing views from the main house, guest house and pool area. The property includes a 2 BR, 2.5 BA main house, two separate guest homes that are 2 BR, 2 BA each and a two car garage. Rarely available 3.4 acre Jupiter Island waterfront estate featuring picturesque panoramic views of the intracoastal and the Jupiter Island Club golf. Design your own private estate. Property can also be subdivided into 2 waterfront estate lots. A must see! Rarely available 3.4 acre waterfront Jupiter Island estate featuring picturesque panoramic views of the Intracoastal and the Jupiter Island Club golf course. Renovate existing home or design your own private estate. Property can also be subdivided. A must see! The Intracoastal views at 4 Isle Ridge are arguably the best on the Island. This property sits on a wide part of the Intracoastal and has beautiful vistas across to the preserve. Total allowable floor area is 8825 s.f. which can be allocated over three separate structures. DEEDED BEACH ACCESS. A large part of Jupiter Island, in its Martin County portion, is a wildlife conservatory and this is owed to the island’s rich history. The shelter was initiated to protect green sea turtles and loggerheads in 1969. It is now known as the Hobe Sound National Wildlife Refuge. This adds value and essence to the beautiful island. Apart from the wildlife preservation, the Town of Jupiter Island is also well known for its expensive mansions, many of which are owned by the rich and famous. Tiger Woods, Burt Reynolds and Celine Dion, to name a few, are some of the celebrities who made Jupiter Island their second home. But Jupiter Island is not just a home for the rich and famous. 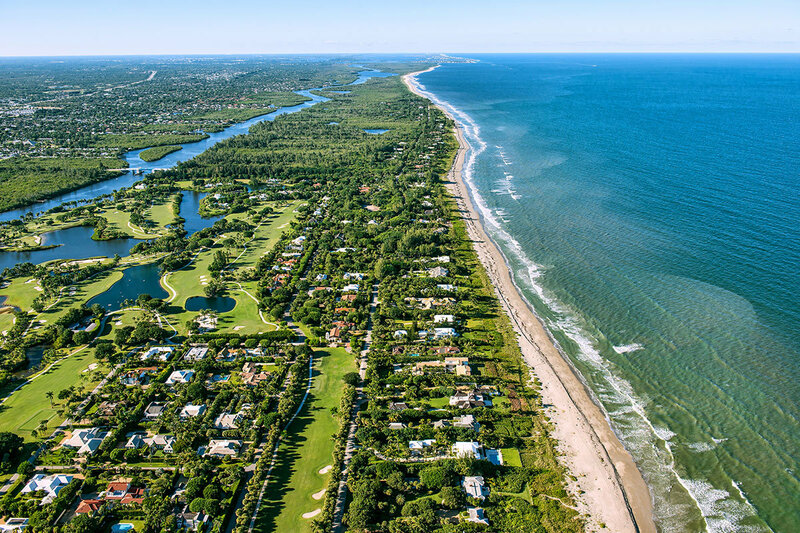 Jupiter Inlet Colony offers many of the island’s residents life by the sea on the south end of the island. Nothing can be more relaxing than being one with nature itself. Come and indulge on the stunning views from north to south via Beach Road, also called County Road 707, which is the main road of the island. You can access the mainland via the Hobe Sound Bridge. If you have thoughts of visiting or living at this rare island, don’t think twice. Living here is like living in paradise!